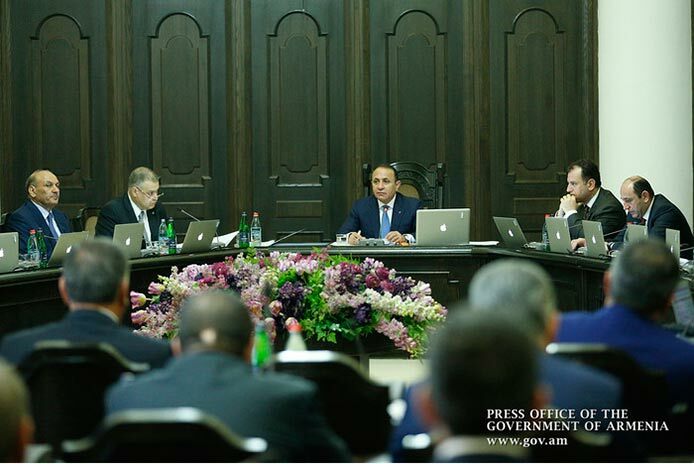 Armenian Prime Minister Hovik Abrahamyan has instructed the Ministry of Economy to deal with issues of the families of soldiers who were killed in Nagorno-Karabakh during the latest escalation of conflict earlier this month. “I instruct you to present them within the shortest possible time,” he added. More than 90 Armenian soldiers and officers were killed and more than 100 were wounded in clashes with Azerbaijani troops in Nagorno-Karabakh since the start of the new escalation on April 2. At today’s session the Armenian government also approved procedures for the Ministry of Defense to start discussing and signing contracts with corresponding Russian bodies for the supply of modern military products under a $200 million loan signed with Russia last year. The issue of the acceleration of the supply of Russian arms to Armenia under the loan program was discussed by Premier Abrahamyan and his Russian counterpart Dmitry Medvedev during their meeting in Yerevan on April 7. The talks were held shortly after four-day hostilities in Nagorno-Karabakh during which Azerbaijani forces used some of the deadliest weapons of Russian make against the Armenian military and civilian population. Russia’s sales of heavy flamethrower systems, multiple rocket launchers and other offensive weapons to Azerbaijan have caused a real uproar in the Armenian society lately. Many believe that as an ally of Armenia and a peace broker in the conflict, Russia should not supply weapons to Azerbaijan – a position not accepted in Moscow. Opposition and civil activists in Armenia, meanwhile, have also criticized the Abrahamyan government for what they describe as under-armament of the military. Armenian officials, however, insist that the Armenian army is even now well armed and equipped to resist any aggression from Azerbaijan against Nagorno-Karabakh or Armenia proper, while the planned arms deals with Russia are part of the ongoing upgrading process. © Copyright © 2002-2016 ArmeniaNow.com All rights reserved. Articles may be reproduced, provided ArmeniaNow.com is cited as the source.